Healthy nutritious snack foods are a key element of maintaining a daily healthy eating plan. These quick, easy, healthy snacks give you a boost of energy and help keep you on track to reach your goals. Healthy snacking may be one of the most important keys to being able to maintain a healthy eating plan. Healthy eating does not mean you should ever feel deprived or like you are starving yourself. On any healthy eating plan, you should be listening to and respecting your body’s cues about its hunger. By making the some good choices about the foods you are choosing, you should never have to feel guilty about grabbing a snack. 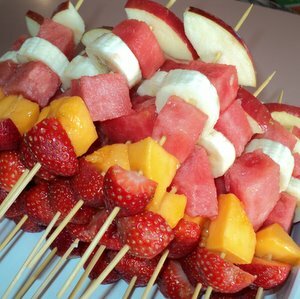 Many easy healthy snacks are delicious, and will make you feel like you are treating yourself! Why Choose Healthy Nutritious Snack Foods? Eating healthy nutritious snacks foods can keep you from making some more impulsive food choices. When you are starving and your blood sugar is low, you may be tempted to eat the first thing that comes your way whether it is the most intelligent choice or not. You should look at snacking as an opportunity to replenish your body or to give it a power boost. Snacks are enjoyable ways to get your body some additional protein, a mid-day natural sugar pick-me-up, or a little jolt of vitamins and minerals. Often, after eating a junk food snack, our bodies are not satisfied on any deep level, it may trigger more cravings for other junk food, and we may feel guilty for having made those choices. What’s the point of putting ourselves through that? By choosing healthier options, you can rest easy knowing that you are nourishing your body while still getting to enjoy some incredible delicious food! raw food diet may seem intimidating in the beginning, even if you know that you want to consume more raw foods for the health benefits. But snacking is where raw food couldn’t get any easier!